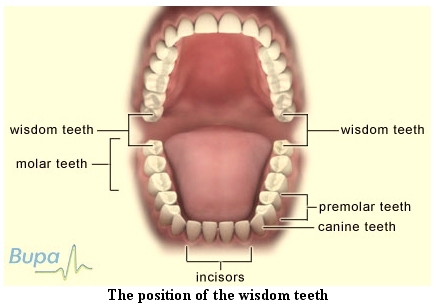 Wisdom teeth usually emerge from the gum between the ages of 17 and 24. 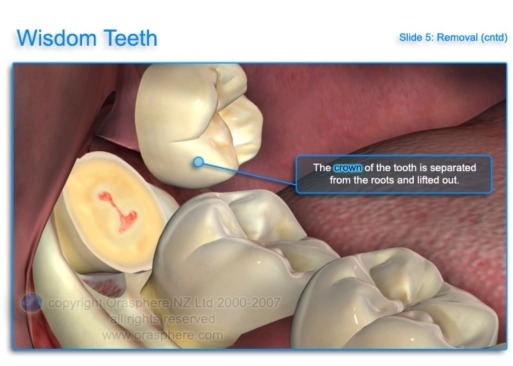 They are the last of the large grinding teeth at the back of the mouth (molars). Some people never develop wisdom teeth but you could have up to four – one in each corner of your mouth. If there isn’t enough space for them to grow at the back of your mouth (impacted wisdom teeth), they can cause pain, swelling or infection. Wisdom teeth have long been considered to be useless as a tooth goes. 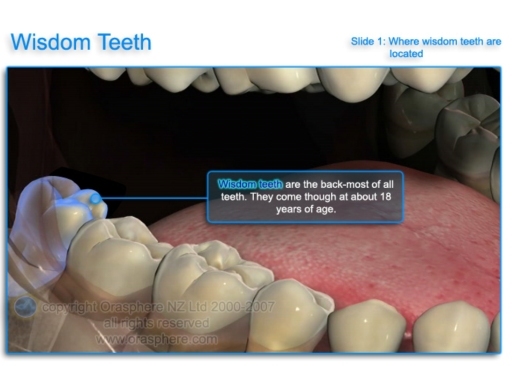 More problems arise from wisdom teeth than any other mouth condition. They are likely to become impacted as time goes on, this will then require surgery to have them removed. They are also likely to become infected because they are hard to keep clean. 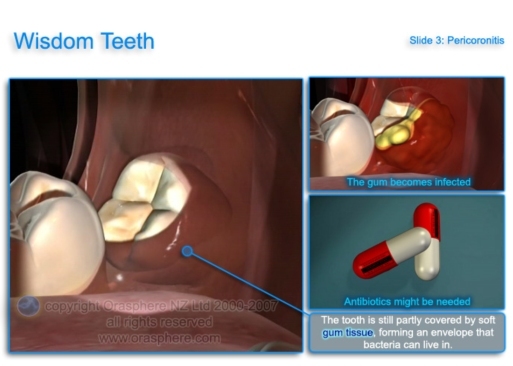 Antibiotics can help treat an infection, but symptoms tend to flare up again. Having wisdom teeth removed is often the only way to permanently relieve your symptoms. 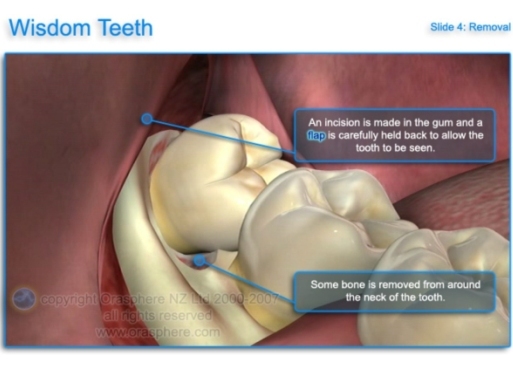 Having your impacted wisdom teeth surgically removed (extracted) can help relieve your symptoms. 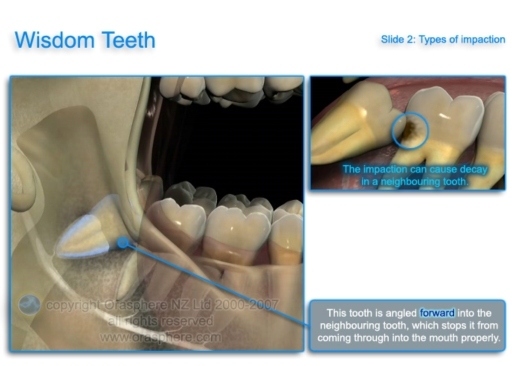 It may be possible for your dentist to remove your wisdom teeth. Today many Dentists are recommending that they be pulled before any problems arise, this would be done while the patient is in his or her teens. Preventative pulling of wisdom teeth is becoming a standard procedure. 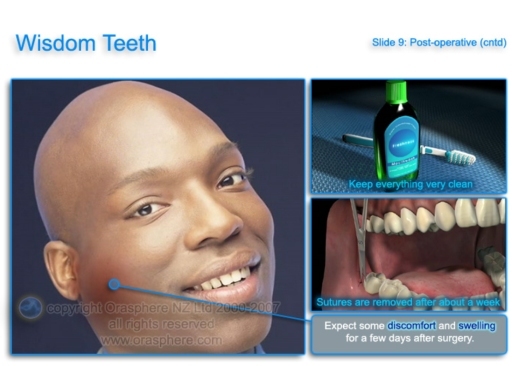 There are still some Dentists out there that want to take the wait and see approach. It was done this way for years. Many people would get to their 30’s and 40’s and all of a sudden, they would begin to have problems with their wisdom teeth. At this age, the roots are fully set and formed making extraction a much more difficult process. You do not want to wait until you have pain to have your wisdom teeth examined, if you wait that long it will make treatment more complicated and the chance of complications rises greatly. You should get your wisdom teeth examined yearly as an adult. This way your Dentist will be able to catch any problems before they get out of hand. 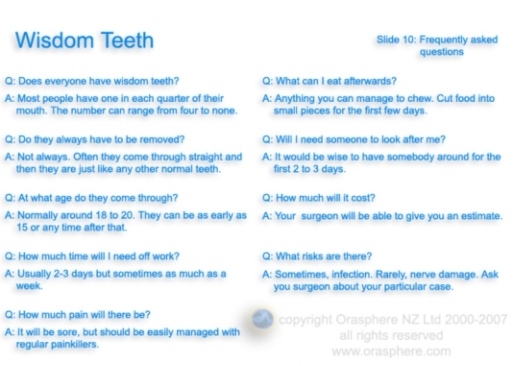 Your surgeon or dentist will explain how to prepare for your operation. For example, if you smoke you will be asked to stop, as smoking increases your risk of getting a wound infection and slows your recovery. The operation is usually done as a day case under local anaesthesia. This completely blocks feeling in the gum and you will stay awake during the operation. You may be offered a sedative to help you relax during the operation. If you go to a dental hospital, you may be given general anaesthesia. This means you will be asleep during the procedure. Your surgeon or dentist will advise which type of anaesthesia is most suitable for you. You may be asked to sign a consent form. This confirms that you understand the risks, benefits and possible alternatives to the procedure and have given your permission for it to go ahead. Once the anaesthetic has taken effect, your dentist or surgeon will cut through your gum and may remove some of your jawbone to reach the tooth. The tooth is removed and the wound is closed with stitches. Most wisdom teeth only take a few minutes to remove but more difficult wisdom teeth can take up to 40 minutes. You will need to rest until the effects of the general anaesthetic or sedation have passed. After a local anaesthetic it may take several hours before the feeling comes back into your jaw. Take special care not to bump or knock the area. You will be able to go home when you feel ready. If you had a general anaesthetic or sedation you will need to arrange for someone to drive you home. You should try to have a friend or relative stay with you for the first 24 hours. Your nurse will give you some advice about looking after your teeth and gums before you go home. You may be given painkillers, antibiotics and mouthwash solutions to take home. You may also be given a date for a follow-up appointment. Dissolvable stitches will disappear on their own in seven to 10 days. Non-dissolvable stitches are removed a week after surgery. Following surgery, you may experience some swelling and mild discomfort, which are part of the normal healing process. Cold compresses may help decrease the swelling. If you need them, you can take over-the-counter painkillers such as paracetamol or ibuprofen. Follow the instructions in the patient information leaflet that comes with your medicine and ask your pharmacist for advice. General anaesthesia and sedatives can temporarily affect your coordination and reasoning skills, so you must not drive, drink alcohol, operate machinery or sign legal documents for 48 hours afterwards. If you are in any doubt about driving please contact your motor insurer so that you are aware of their recommendations, and always follow your dentist’s or surgeon’s advice. Don’t vigorously rinse out your mouth during the first 24 hours after having a wisdom tooth removed because this can disturb blood clots that help the healing process. After meals you can rinse gently with warm salt water (half a teaspoon of table salt dissolved in a glass of water). You should brush your teeth as usual, but keep your toothbrush away from the healing wound for the first couple of days. At first, you may feel small fragments of bone with your tongue. These are the edges of the tooth socket and will soon disappear as the gum heals. To begin with, you should eat soft foods, gradually returning to a normal diet once your jaw feels less stiff. If your gum bleeds, fold a clean handkerchief or piece of gauze, place it on the bleeding gum and bite on it for at least 20 minutes. Don’t rinse your mouth out or lie down until the bleeding has stopped. 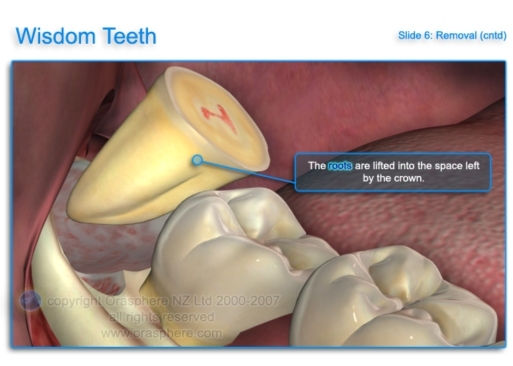 Wisdom teeth removal is commonly performed and generally safe. However, in order to make an informed decision and give your consent, you need to be aware of the possible side-effects and the risk of complications of this procedure. You may have some facial swelling, pain, jaw stiffness and some bleeding for up to two weeks. These symptoms are usually at their worst for the first two or three days and then gradually improve. 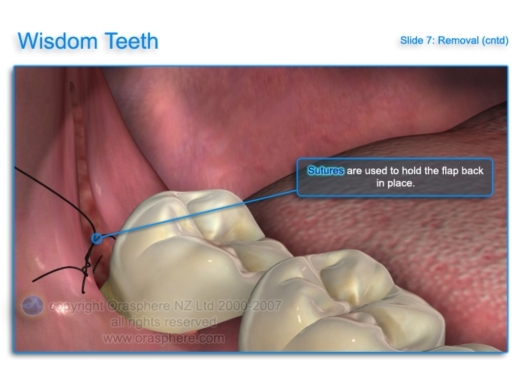 This is when problems occur during or after the operation. Most people are not affected. The possible complications of any operation include an unexpected reaction to the anaesthetic or excessive bleeding. The exact risks are specific to you and will differ for every person, so we have not included statistics here. 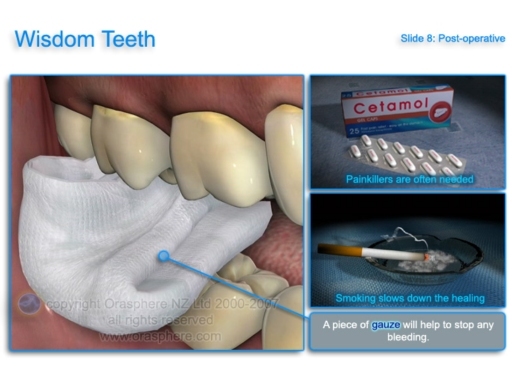 Ask your surgeon or dentist to explain how these risks apply to you.